RESOLVD aims to facilitate the increase of renewable distributed energy resources (DER) in the low voltage (LV) grid and to improve efficiency, while ensuring quality of supply. To achieve these goals, the project team has identified a list of seven business use cases, that best define the needed features and the actors involved in the challenge. Let’s have a look at them. The increase of DERs connected to the distribution network, especially at LV level, can create problems related to safety, like uncontrolled islanding. For this reason, it is necessary to apply preventive measures through detection and interruption mechanisms. 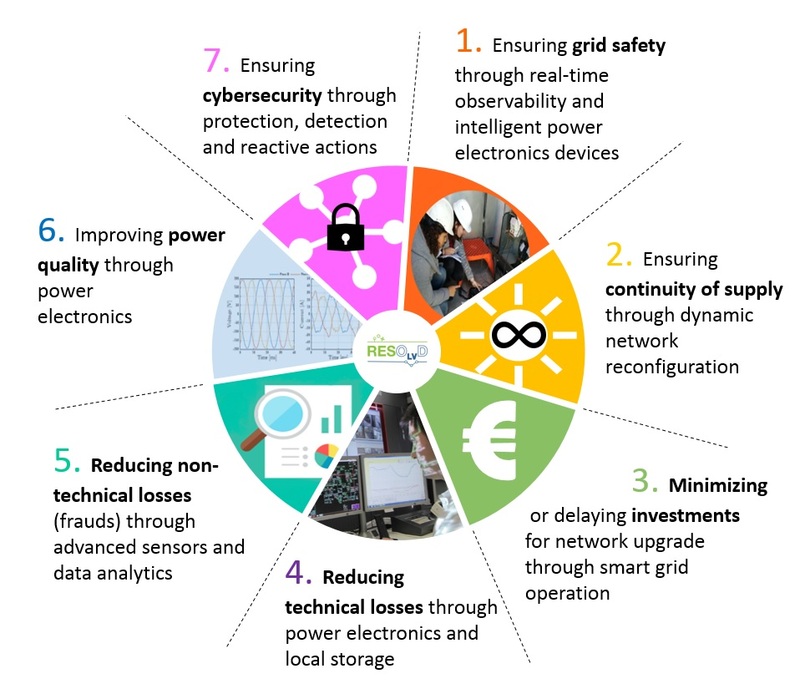 RESOLVD allows implementing these measures by employing intelligent power electronic devices, which sense the grid conditions and trigger the interruption of the islanding phenomenon, offering real-time observability and control capabilities over the LV network. RESOLVD aims at reducing the frequency and duration of supply interruptions, through grid reconfiguration and fault bypass. The technology utilizes the sensing infrastructure distributed on the LV lines to localize the fault and then it calculates, at a central level, the new grid arrangement to redirect the power flow, through remotely controlled switches. To accommodate a growing number of distributed generation sources in the LV network without violating the statutory technical limits or standards, the grid must be upgraded. RESOLVD aims at reducing the investment associated to this grid reinforcement by making the system smarter and more efficient, employing technologies that permit forecasting and prevent congestion and over/under voltage issues through local storage and grid reconfiguration. If the preventive actions are not sufficient and a critical event arises, threatening the stability of the system, RESOLVD allows real-time intervention, for example through voltage control functionalities. Power line losses can be caused by an inefficient excess of current in power lines. RESOLVD addresses this issue by improving power quality issues and avoiding congestion. Another cause of technical losses is the energy transport over long lines. The solution proposed by RESOLVD in this case, consists of storing locally produced energy and consuming it later, thus avoiding unnecessary transport losses of both production and consumption. This is possible, thanks to sensing devices, forecasting and scheduling functionalities, purposely developed optimization algorithms, and local storage. Customer fraud represents a loss of profit for electric utilities. RESOLVD offers the possibility to detect and prevent non-technical losses, thanks to high monitoring capabilities over grid consumption, advanced data analytics and modelling software solutions. Another minor negative consequence coming from DG is power quality degradation. Thanks to RESOLVD and the functionalities it allows through power electronics, it will be possible to reduce harmonics, reactive power excess and phase unbalance in the LV grid, ensuring high power quality to final customers. Nowadays, the need for robust cybersecurity systems is imperative for electric utilities, as hacker attacks against the sector become more common and the integration of ICT technology in the “smart grid” increases, creating a large attack surface. External cyberattacks and intrusions can result in a variety of incidents, ranging from theft and/or manipulation of data to denial-of-service conditions leading to a complete outage of the whole system. It is thus a priority to secure and harden the systems developed in RESOLVD, through cybersecurity protection, detection and reaction actions.